Daniel Andersson had a great start in the under 21 Qualifying Round in Eskilstuna Sweden scoring a 15 point maximum which made promoters sit up and take notice, then in the Quarter Final in Vetlander he did it again 15 point maximum. However in the semi-final in Pocking Germany he found the going tough qualifying for the Final at reserve with 7 points. He rode in the Final in Elgane Norway in August and scored 4 points. Daniel found himself in demand and spent the winter in Australia changing his name to the the Swedish short version Dalle. 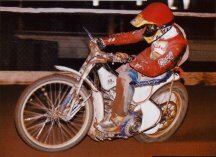 He joined Oxford for the 1995 season with his mentor Jimmy Nilsen, Cradley wanted to sign Dalle then but could not fit him in with the averages. He struggled at first on the tight English tracks but settled down once he had sorted his engines out to suit the British tracks. 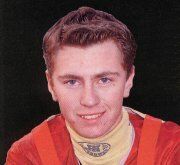 In 1996 Cradley Promoter Sven Heiding and Team Manager Jan O Pedersen bought Dalle in to replace Simon Cross who had decided to move to Coventry after the closure of Dudley Wood. He ended up with a creditable 6.19 average from all his meetings. He only once failed to score, in June at Wolves in a four team tournament. His lowest score in an official match was one at Loomer Road against Eastbourne in September and his best performance at Sheffield 12 points from 5 rides in September. When Cradley closed in 1996 at Loomer Road Dalle sat out the 1997 season but was signed by Glasgow unfortunately the weather at the start of the season was awful with lots of rain-offs, then when the season started Dalle got injured and was out until June, he struggled with his injuries to his back and although he had a few good scores he never captured his previous form. He returned to the UK with Belle Vue in 2000 but was out again after just 6 meetings. Edinburgh signed him in 2001 in the Premier League and he stayed with them through 2001/2002 and maintained an average of over 7 points per match.